In June of this year, my husband and I vacationed in Mexico. Within days, my skin cleared! It must have been the perfect combination of no stress, humidity and sun. I was amazed! But within a couple weeks of returning home, I slowly started breaking out again. Wanting to maintain what I had experienced in Mexico, I hit the web for research and I found your website. I started your diet July 16, 2011 and I today is day 88. Ive seen such a HUGE difference!!! For the first time in probably 15 years, I have clear skin on my hands! They are about 99% clear and its amazing! My ankles are clear and most of my arms are now clear. The psoriasis itself is so much more thin and not as red. I admit the diet is difficult at times; I find the lack of structure on the weekends make it difficult for me to hit my 10 points a day, but during the week its much easier. Im surprised at how tasty the shakes really are, though I still have to convince myself every time I open one to drink that it tastes much better than it looks. This diet truly works, and its maintaining my skin at a level that I am comfortable with again. 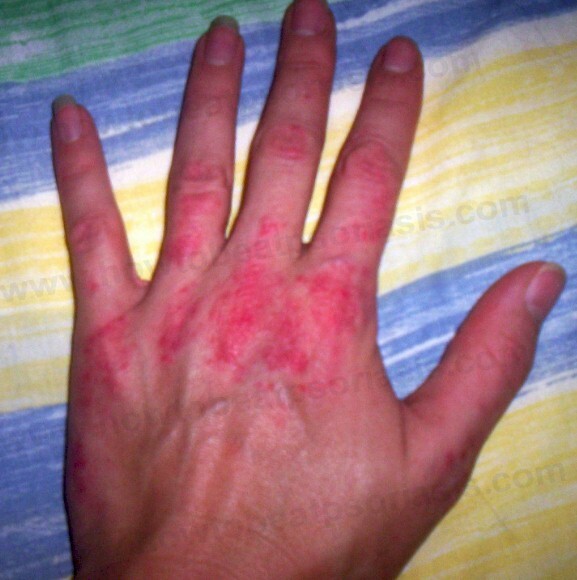 Ive attached a picture that I took of my left hand in 2007 (taking pictures of my skin was never high on my list). Sadly, this is what my hand looked like until about 4 months ago. The other picture is what my hand looks like today, thanks to your diet! Thank you, thank you, thank you Charles! This diet is a God-send! Thank you for taking your time and being the guinea pig to find something that TRULY WORKS!!!!!! Im keeping up the diet and am enjoying looking at my clear hands! Just over six months ago, I started on this program. I had large, red scaly patches of psoriasis spread over most of my body, and was in a pretty bad way, physically and psychologically. Two months previous to this I had finished a course of UVB light therapy, which had shown reasonable success, however my psoriasis had come back and was spreading fast. It was looking fairly likely that I would have to progress onto systemic treatment, involving taking cyclosporin, with all its associated nasty side effects. I had read up on all the negative effects of taking this drug, including re-occurence of psoriasis once the treatment stops, and felt very strongly against taking it. It seemed to go against every grain of common sense to pollute my body with such a devastating drug to clear up my skin, but was facing the reality that if my skin kept on getting worse and worse then I would simply have no choice. I felt as though I was standing on the edge of a black hole, hand on heart that was truly one of the darkest, lowest points of my life. Then, almost by chance, I stumbled upon Charles' website (I never normally browse YouTube). I read with interest about his own history of the disease, and about how he had managed to overcome his psoriasis by following his program. I immediately started the program, and have never looked back. What I found most helpful was how specific the program is, it tells you exactly what is 'good' or 'bad' for your skin, unlike an e-book I made the mistake of paying good money for which only gave me vague hints and suggestions. The program IS hard to stick to as it involves an enormous amount of will-power, BUT the end results are most definitely worth it. So, Charles, I just want to say a massive THANK YOU for sharing this program with me and everyone else, you have enabled me to get my life back and have allowed me to be a happy person once again, which is not only great for myself but also benefits my husband and little girl as they now have their happy wife/mummy back. For this, I will be eternally grateful. Thank you so much. I wanted to say thank you for your program... I think you may have pandoras box here. I havent been logging what I do each day, but I have been sticking to the diet religiously for the past week and a half. I am going to start logging things to show my progress. Also I started the shake today! I was making it this morning, then smelled it as I was pouring it and thought  oh I just wasted a ton of cash. To my surprise it wasnt half bad!!! Also my body is craving it now, I am eating normal food to spread my shake out throughout the day otherwise Id just drink that all day long. You may also want to suggest people sun bathe for 10 to 15 mins a day in the affected areas, assuming they can get to sunlight. That does wonders for my skin along with dieting and this shake and a strict exercise program I feel I will finally be able to enjoy short sleeves and shorts again. ... this 4th wk has been amazing transformation . so ppl if you start this please stick with it I am glad I did and? will be keeping it up . I have been on the diet for 12 weeks and although it has not yet cleared my psoriasis there is an improvement, I wasn't able to start with the shake right at the start as I had no blender so I am hoping that now as I carry on with the diet and shake things will continue to improve. Even if it does not completely alleviate my psoriasis I feel that I am eating so much healthier now so that has to be a good thing for my overall health. Thank you for having this information available to other psoriasis sufferers you have been of more help than any gp or dermatologist. About a year ago I started the program outlined on this site. I was just diagnosed with severe palmo-plantar psoriasis and I was facing a lifetime of medications. I wanted to give natural approaches to healing psoriasis one full year before going back to my dermatologist to face all the pills, creams, and needles and all the potential side effects. Thankfully the approach outlined on this site worked like a champ. Overall my psoriasis is 90% cleared. The affect on my overall health has been equally impressive: 20 lbs weight loss, no more irritable bowel syndrome, and increased energy. For me there is no going back to my bad old ways. For those starting out I encourage patience and some degree of experimentation. Dairy and yeast trigger my psoriasis but certainly other psoriasis sufferers are not bothered by either. Understanding your body's relationship to food can take months. But as you gradually refine your diet your psoriasis should improve. Don't let minor setbacks discourage you. Keep your eye on the end game: control over your psoriasis for *the rest of your life* without medications!! Best of success to everyone!!! I have followed your diet and the rules on the excel spreadsheet that you kindly sent me at the end of May 2009. My armpits are a bit of a problem but even they do not flare up that often. ...After one month of following your program (with some minor adjutments) I know it works, and I know this is what I need to get rid of psoriasis! Thank you thank you thank you! P.S. The diet is just great - the couple of times I've had the willpower to stick to it without "cheating", I see clear, definite improvement. I'd just like thank you for putting this eating diet up on the internet. It has helped me so much and made such a difference with my psoriasis on my face. It went from being bumby, dry and red to hardly noticing it at all. This program has given me confidence and I can live my live normally again. Charles: You are truly a live saver. I have been on the diet now for almost 3 months and my psoriasis is almost gone. Still waiting for my nails to return to normal but they are almost there. Also, the same for my hair but little tiny hairs are growing back in. But my skin is back to normal, I can't believe it. You would never know to look at my skin that I ever had this blasted disease. I also lost weight and people always ask how did I get so thin. I tell them psoriasis or skinny. I choose skinny.... Anyway, God bless you for helping so many of us. Thx Charles. ... I have tried acupuncture, Chinese herbal medicine, went down to the dead sea and have applied all sorts of nasty ointments and Creams. I event spent 2 months in St. Thomas's hospital, London. Out of desperation and because my emergency appointment in June was booked for 25th August !!!!! !, (the Doctor said that she had never seen a body in so much pain), I went onto the Internet and found a site which pointed me to a website and thought I would give it a go. What the site says is "you can donate", and to be fair it is worth every pound I sent to him, in fact its worth thousands to me to have this relief. Its up to you what you send. Its not a con as its worked for me and I currently talk to the man behind it on a regular basis....He will send you a spreadsheet which contains simple instructions and you can track your progress. I have just asked him to put a column in for weight, as I have just lost 16lbs over 26 weeks. I had it over 80% of my body and very painful, let alone the mess, and now all you can see after 26 days is the outline and a bit of dry skin. Sorry for not writing before, I've been too busy with my new work and been away from my hometown, finally I made myself the time to write and I'd like to thank you because after almost 2 and a half months since I started the program I now see amazing results!, the psoriasis is almost gone, I feel I lot better and also I've dropped 5 pounds. Also I took another pictures for before/after comparison. Words cannot describe how much I thank you for your help. I am 63 years old and have had psoriasis since I was 14. It wasn't too bad in the beginning but as I grew older, it seemed it got progressively worse. About ten years ago after undergoing two liver biopsies due to pharmaceutical drugs I've been taking for years (to keep me clear of my psoriasis), I decided to do away with drugs and go the natural healing way. 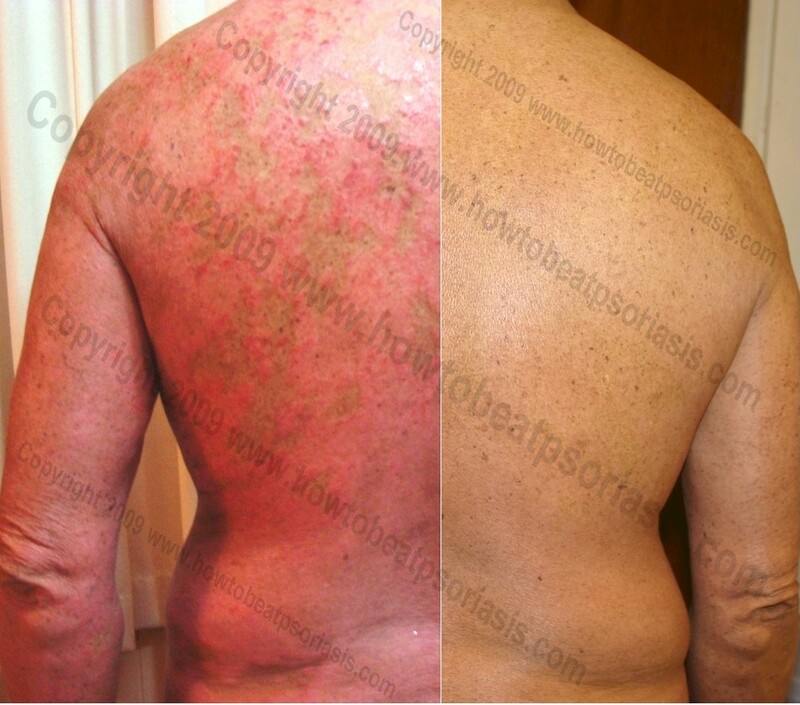 I started with Dr. Pagano's program which helped some but it did not get rid of my psoriasis. However, it encouraged me I was on the right track. Later, I discovered Chinese herbal pills on the internet and that helped. I was clear for about 4 years then it wore off. A naturopath prescribed liquid zinc for me and after 6 months I cleared. It was good for about 4 months then the lesions came back 'with a vengeance.' At this point, I saw HowToBeatPsoriasis.com on You Tube and started your shake program January this year. You said I should clear in three months. However, after FIVE months I was getting even worse. By May 1st, my entire body was practically covered wall-to-wall with lesions; I was ready to give up! I was drinking about 12 ounces of the shake four times a day and you advised I reduce my shake intake to half, which I did. You told me to hang in there and by the 1st of June I was starting to see signs of clearing. During the entire month of June, my entire body experienced such dramatic clearing and relief from psoriasis that it seemed so miraculous! Now I can wear short sleeves and shorts which I haven't been able to do in years! What can I say, this is THE program that has so far worked for me. Thank you for your program and your coaching... you are truly God-sent! and i have to say that i am hooked. where the skin was very red and thick and sheding all the time. wish that someone had told me earlier. alternative...dont like soya milk in tea much. believe this method is working!!! Lately, you sent me your program. Since two and a half week I drink your shake. Each day, about half a litre and strictly based on the advised ingredients. Right from the start it felt good and quite quickly I noticed the results. My skin doesn't flake no more and the red stains are almost gone.... My skin recovered so fast and feels so soft again, I still can't believe it. Thank you for sharing your effective and easy method to beat this desease. The shake doesn't taste very nice, but in the light of the results, it is 100% worth it. If you send me your adres, I like to send you a card from my home town as a more personal thank you. reason I don't like to call it "disease" sorry It's just me. Thanks again and GOD bless you, we'll keep in touch. PS: I've included some pictures of my improvement." "Hi Charles just opened up my / your file ... I know this is going to work for me !!" "Hey Charles , just a quick update ... I`m approximate 30 days into a 60 day plan - My aim been a swim in Florida @ xmas...overall a fantastic result , which I was pretty confident we would achieve ... visited Doctors a week or two in and she was very impressed ... I am tackling it with such a positive approach... she wasn't too help full with any suggestions other than to try an give me some different creams .. shower emollients , which I haven't taken up yet... seem to be doing ok as it is...its Fantastic almost miraculously different , my forearms, and calf`s are still quite stained but other than that no itchiness, no flake ness , well on target for my Xmas swim in the Florida sunshine. All the best , please keep in touch , I know i will , feel free to quote me, and pass on my details to any other Uk, European doubters." Thank you very much for the hard work that you have put into your program. I was pleasantly surprised to see all the wonderful information you have put into it. I plan on starting immediately. Hi Charles, My name is Travis. U send me the diet about 2 weeks ago. I just started the past 4 days. I can honestly say, " the flakes are falling off, the redness is down, and I'm starting to see WHITE SPOTS in the centers of the patches!!!! The one spot on my stomach has just peeled full thin skin like sunburn. I hope to have the willpower to continue!! !....Good Luck Charles & God Bless!!!!!!!!!!! "Im not a religious person but if there is God may he bless you over and over again. Thank you so much. No one can understand what this is like but people who have it and there is so many people trying to take advantage of people like us suffering from this disease." "Thank you so much! We will try this program right away and let you know the results. Thank you again and God bless you!" "Thank you so much for sending me your program. You really created it to be simple to use and boy do I appreciate That!!" "I applaud you on your spreadsheet. I think it's a great way to put a strict diet to practice." "Hi Charles, I wanted to thank you for the report. Wow - you've really figured this out. Thanks. All the best"
"Thank u for the program..soon as possible i'll send photo..thx u so much.."
"Hi Charles, Wow you've put a lot of effort into creating this, kudos to you. Please keep up the good work!" "Hi Charles, ...The good news is this system freaking works man... Within two weeks the psoriasis on my arms had recessed to smooth, non itchy, white patches of new skin. The psoriasis on my legs has also faded, but not as drastically. Keep in mind my case is fairly severe , if severe is considered more than 5-10% coverage. My arms, from my shoulder to hands and my legs from my knees to ankles, are the affected areas. My scalp slightly but that has faded. Bottom line is I've never had this type of clearing ...I appreciate all the help and thanks so much!" © COPYRIGHT 2008-2009. 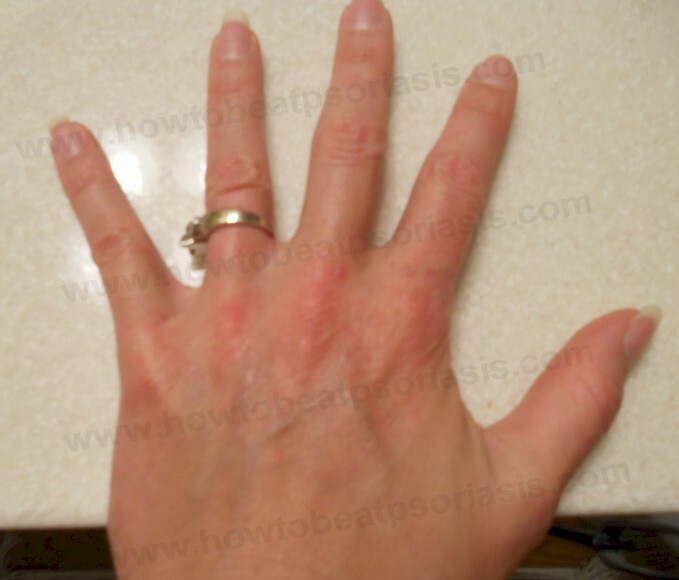 HowtobeatPsoriasis.com All rights reserved. Duplication or sharing of the information strictly forbidden without written permission of it's owners.